Elizabeth Margaret—better known as Em—has always known what life would contain: an internship at her father’s firm, a degree from Harvard and a career as a lawyer. The only problem is that it’s not what she wants. When she gets the opportunity to get away from it all and spend a month with the aunt she never knew, she jumps at the chance. While there, Em pursues her secret dream of being a chef, and she also learns that her family has kept some significant secrets from her, too. And then there’s Cade, the laid-back local surfer boy who seems to be everything Em isn't. Naturally, she can’t resist him, and as their romance blossoms, Em feels she is living on her own terms for the first time. 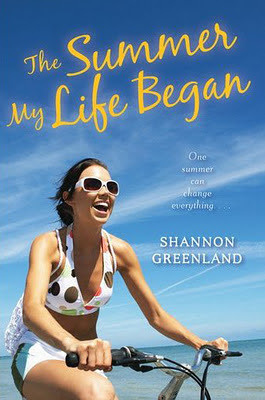 Shannon Greenland’s contemporary YA novel, The Summer My Life Began, highlights the importance of family and forgiving. With a generous dash of romance and healthy layer of optimism, fans of Sarah Dessen’s novels will enjoy its relaxed pace and emerging lead female. Elizabeth Margaret’s life is all mapped out for her. Her parents plan a summer internship at a law firm then it’s off to Harvard; it’s the only path she believes is available. After a few weeks on a small island in the Outer Banks, North Carolina with her Aunt Tilly, and cousin, Frederick, Em discovers new paths that lead her away from the future set by her ‘status seeking’ parents and grandmother. It’s been a while since I’ve come across such a lighthearted story. The Summer My Life Began has a remarkably homey feel to it. Despite early warning signs that the secrets surrounding Em’s family could be potentially disastrous, I held hope in my heart that there would be a happy ending. I loved reading Em’s exuberance for cooking and the natural wonders of the island. I smiled just as much as she did while in the presence of her newly discovered family and friends. It says much about a young girl when she meets family, that she had no idea existed, and doesn’t get torn up about it. Instead, Em makes the best of the situation and focuses on getting to know them. She is decidedly a strong and admirable character. Em is confident without being arrogant or a braggart. From time to time she needed a boost to actually pursue her true dream of becoming a chef. Fortunately, her younger sister, Gwyneth, encouraged her to keep practicing and Em found a mentor to help hone her skills. Really, everyone on the island that Em interacted with helped her in one way or another, whether it was when she needed a shoulder to cry on or a good old-fashioned tour guide. Shannon Greenland’s emphasis on family sets The Summer My Life Began apart from upcoming YA contemporary novels. The book’s May 2012 release is just in time for it to be a perfect summer read.